Since multisheet publishing to dwf came out, and subsequently the recent Design Review versions, I have been a big fan of multi-sheet DWF Publishing, so much so that I put links to Design Review in my emails, and promote it at every opportunity. I even became a Beta tester for Joseph Volker’s team (hush hush and all that). The problem I usually face is not necessarily with Design Review, but is in the AutoCAD Drivers for dwf plotting, and how that relates to Multi-sheet. I just recently installed a service Pack, and Publish in Background defaulted again. As many of you are aware, many of you are not. 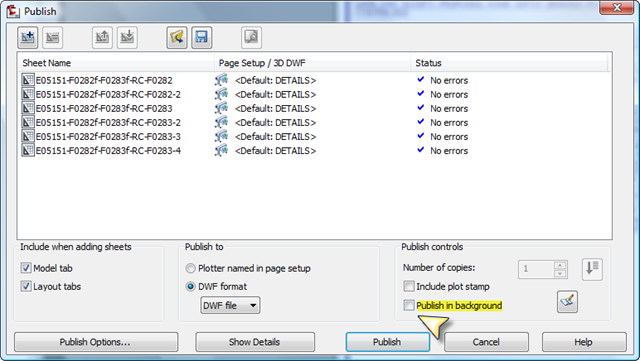 If you try multi-sheet publishing and if crashes, even if it is not DWF, try killing the background publishing. There have been many write-ups on this, and it certainly applies to my setup. However since I’m at work on Sunday, and it just crashed me AGAIN, I thought I’d remind the new guys.